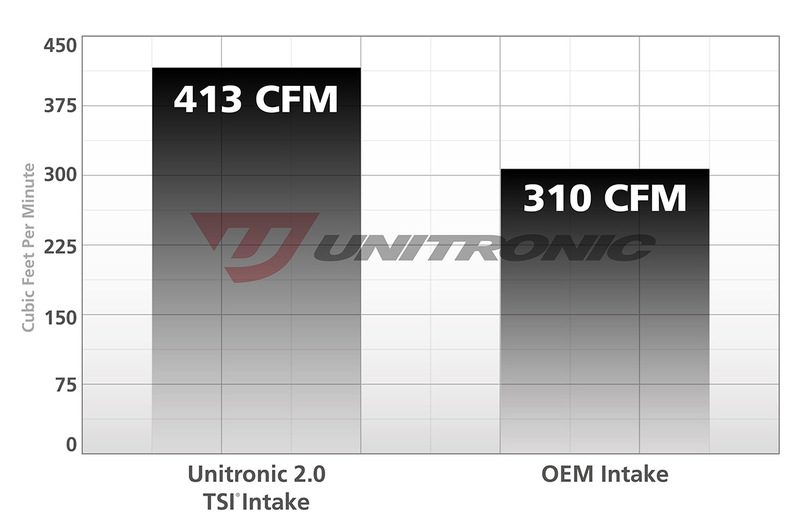 With extensive background in engineering the finest in Performance Software, Unitronic developed an intake system that maximizes performance, while maintaining precise MAF scaling, as a result of its sensitivity on this platform. This translates into a complete Cold Air Intake System that is sure to perform to the maximum, providing increased power, air velocity, and throttle response, while also decreasing air intake temperatures and turbo lag. 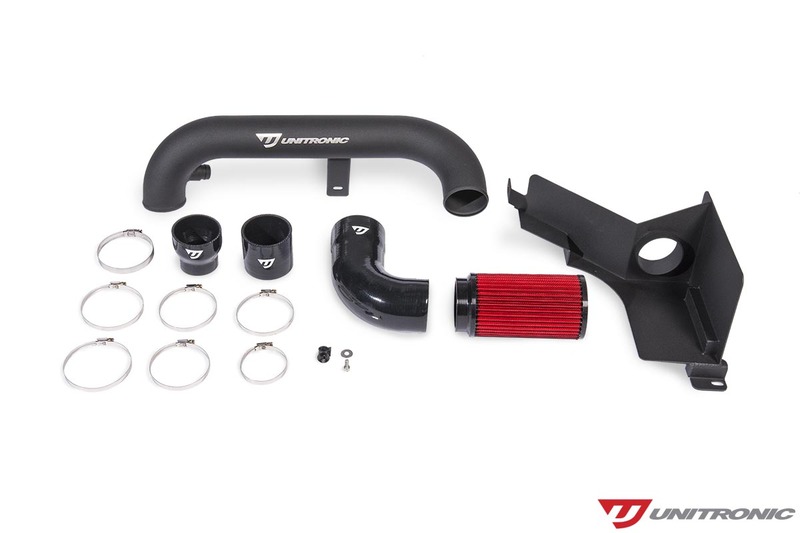 In addition, Unitronic’s Cold Air Intake will enhance the sound of your turbocharger and diverter valve. Intake Systems featuring a free flowing, open element design will result in a more audible sound from your vehicle’s turbocharger. Additionally, due to the Diverter Valve (DV) being located directly on the compressor housing of the turbocharger, an audible resonance can be heard through the free flowing, open element design on this application, as illustrated with the associated diagram. Lightweight high quality material precisely engineered to ensure a perfect fitment in the engine bay. Heavy duty, heat resistant and durable 4-ply silicone reducers and 5-ply silicone couplers and elbows will not collapse under heavy acceleration. These quality hoses will not crack or tear overtime. Aluminum components are powdercoated to give them a long lasting surface finish. Utilizes all OEM mounting locations on the engine. Heat shield is made from 5051 Aluminum to reduce weight and to ensure hot air doesn’t make its way to the air filter. Unitronic’s proprietary 3’’ dry cotton filter is engineered to maximize air flow with its radius base while keeping dust and foreign debris away from your engine. 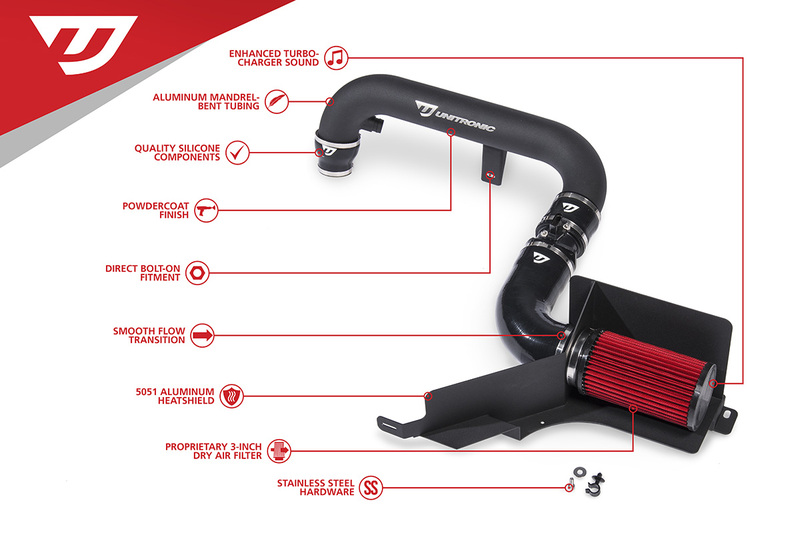 The Unitronic Cold Air Intake System for vehicles equipped with the 2.0 TSI Gen1 engine is designed to be simple to install with all the hardware necessary included. Installation time will take approximately one hour including the removal of the factory intake and installation of your new intake system. The supplied instructions provides a comprehensive installation walthrough on a MK6 GTI (including CCTA and CBFA revisions). It includes a complete list of tools and other requirements necessary for the installation. *Heat shield bracket must be bent to reach radiator support to fit Passat and Tiguan models.